All types of window graphics supplied in high quality vinyl. Frosted vinyl for making meeting rooms more private,, Frosted vinyl can be applied to partitions to create a design, Corporate logos on windows can also be applied to doors and wall panels, Colour logos applied to windows advertising company products and goods, ideal for Solicitors, Accountants where many different types of services can be advertised. 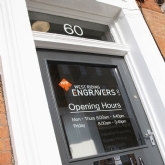 In the refurbishment of our showroom we have applied vinyl bullet points to internal windows in our corporate colours and frosted vinyl, why not call in and take a look.